As I write this I am watching the beautiful snow come down outside my window. I love the snow! And I love this time of the year. Christmas is such a wonderful time full of blessings and love! It can also be a stressful time, but today I am enjoying a relaxing Saturday with my family. Allen took the boys for a walk in the snow and I decided to share a before and after post with you. Last weekend was the final Sweet Clover barn sale of the year. Although it had to be cut short because of the winter storm that came through last weekend, Amanda and I sold quite a few pieces. One of the pieces that sold was this dining room table and chairs. The beautiful tufted bench was Amanda’s creation, so I can not take credit for that. 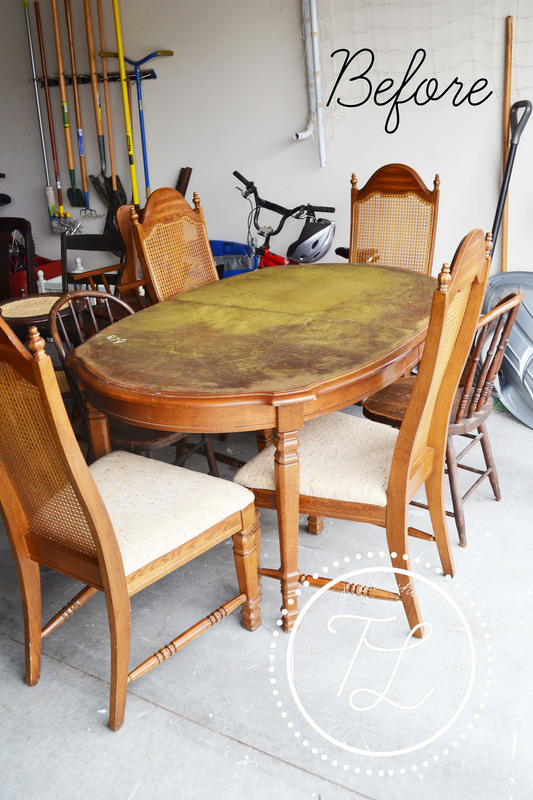 I bought this table set at an auction last spring and I think I shared a pic of it on Facebook or maybe here on the blog. I was going to have it finished for the Lucketts fair, but I just didn’t have the time to get it done. The table itself was in a rough state. You notice the top is a bit green from someone glueing a foam covering on it. The table took quite a bit of work to strip and sand. So I kept putting it off all summer. And finally this fall I decided to tackle it. I actually thought very hard about setting it at the curb and letting someone else deal with it. But friends encouraged me to get it done.I forgot to also mention the entire dining room set was a steal at auction, so I really would not have felt too guilty about letting the table go, and just keeping the chairs. But I got it done, and I was very happy with the results! I even made little matching lumbar pillows for the chairs. I hope the person who bought the set enjoys it as much as I do. Someday I will have a dining room set that has upholstered seats! But not until my boys are a little older. Here is another one of my pieces that sold. 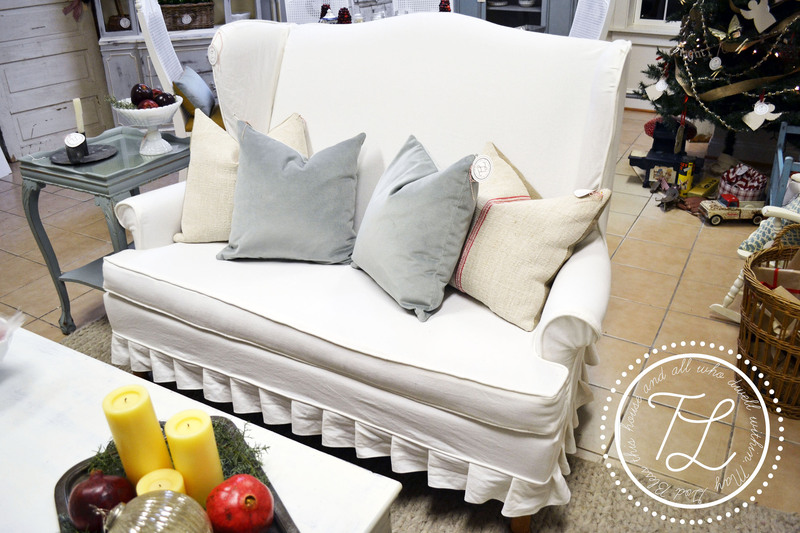 My second slipcovered settee! I really like the high back of this one, although it was a bit more challenging than the last one. I am considering purchasing a industrial sewing machine soon! My little one is having some trouble handling the layers of fabric for the larger slipcover pieces. And it looks like I will continue to tackle larger projects….so….I just need to convince Allen that I NEED one! I hope you are all enjoying this holiday season! More projects in the works for the New Year! And I am going to finish up some ones around my house…finally…! This entry was tagged dining room set. Bookmark the permalink. Very nice work and beautiful pieces. Look for more to come. Happy Holidays! Hi, I`m a big fan of your work and I have a question which bothers me for a long time. I very often face problem with dirty marks appearing on the surface of my furniture after painting with Annie Sloan’s chalk paints. It happens especially when wood is sanded. Can you please advice me what primer or undercoat I should use to make my life easier? Or at least point me to a link on the Internet? Thank you so much for your advice!! I don’t know if you remember me but we went to CEFC and I had Alec in my first grade Sunday school class. 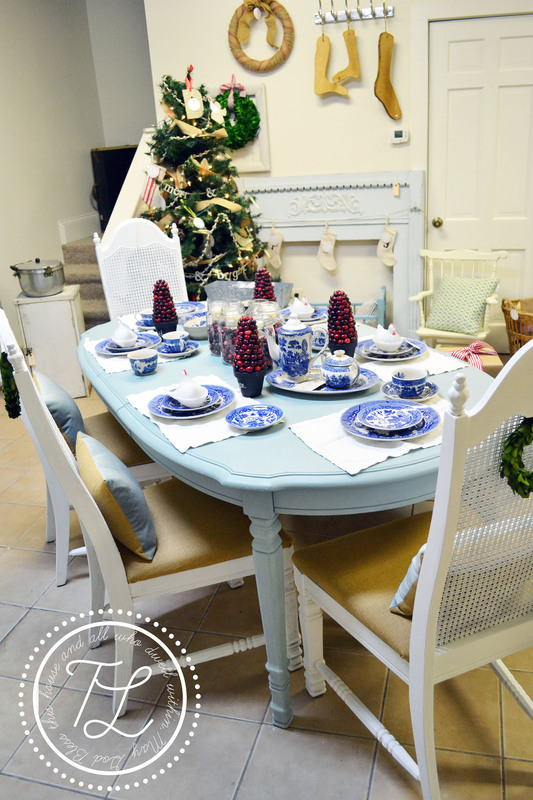 I saw this table and chairs at the Christmas program the church had and I couldn’t believe how much like my mother’s dining room set it was. You did a beautiful job. Well, to make a long story short, my mother was recently placed in a nursing home and we had a auctioneer take a lot of her furniture away to sell but he wasn’t comfortable taking this set because the cloth seats have some marks on them. Right away I thought of you. I don’t know if you would be interested at all in this set to refinish? It’s not in bad shape at all but it could use a facelift. Of course I remember JoAnne 🙂 Is she looking to sell it? Or are you keeping for yourself? I would love to come take a look at it if it is for sale. And if it is how much is she asking for it. Thanks for thinking of me!